Hatton, born at Kirby Hall, Northamptonshire, on 19 May 1791, was grandson of Edward Finch-Hatton, and son of George Finch-Hatton (1747–1823) of Eastwell Park, near Ashford, Kent, M.P. for Rochester 1772–84, by his wife whom he married in 1785, Lady Elizabeth Murray, eldest daughter of David Murray, 2nd Earl of Mansfield. She died 1 June 1825. George William, the elder son, was educated at Westminster School and Christ's College, Cambridge, where he proceeded B.A. in 1812. On 13 October 1809 he became a captain in the Ashford regiment of Kentish local militia, on 14 December 1819 commenced acting as a lieutenant of the Northamptonshire regiment of yeomanry, and on 7 September 1820 was named a deputy-lieutenant for the county of Kent. 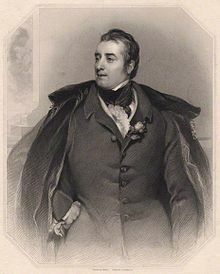 His cousin, George Finch, 9th Earl of Winchilsea and fourth earl of Nottingham, having died on 2 August 1826, he succeeded to these peerages. He presided at a very large and influential meeting held on Penenden Heath, Kent, on 10 October 1828, when strongly worded resolutions in favour of Protestant principles were carried. In his place in the House of Lords he violently opposed almost every liberal measure which was brought forward. He was particularly noted as being almost the only English nobleman who was willing to identify himself with the Orange party in Ireland, and he was accustomed to denounce in frantic terms Daniel O'Connell, Maynooth, and the system of education carried out in that college. Occasionally he took the chair at May meetings at Exeter Hall, but his intemperate language prevented him from becoming a leader in evangelical politics. The Catholic Relief Bill of 1829 encountered his most vehement hostility, and ultimately led to a duel with the Duke of Wellington. Lord Winchilsea, in a letter to the secretary of King's College London, wrote that the duke, "under the cloak of some coloured show of zeal for the Protestant religion, carried on an insidious design for the infringement of our liberties and the introduction of popery into every department of the state". The duke replied with a challenge. The meeting took place in Battersea Fields on 21 March 1829, the duke being attended by Sir Henry Hardinge, and his opponent by Edward Boscawen, 4th Viscount Falmouth. The duke fired and missed; he claimed he did so on purpose. However, the duke was known as a poor shot and accounts differ as to whether he purposefully missed. Winchilsea kept his arm by his side at the command to "fire" then quite deliberately raised his arm in the air and fired. He then apologised for the language of his letter. It is almost certain that Winchilsea and Falmouth had agreed on their course of action, as the letter of apology was already prepared. He was a very frequent speaker in the Lords, and strenuously opposed the Reform Bill and other Whig measures. He was gazetted lieutenant-colonel commandant of the East Kent regiment of yeomanry 20 December 1830, named a deputy-lieutenant for the county of Lincoln 26 September 1831, and created a D.C.L. of Oxford 10 June 1834. He died at Haverholme Priory, near Sleaford, Lincolnshire, 8 January 1858. He was the writer of a pamphlet entitled Earl of Winchilsea's Letter to the “Times,” calling upon the Protestants of Great Britain to unite heart and soul in addressing the Throne for a Dissolution of Parliament, 1851. He was responsible for the phrase Kentish Fire meaning prolonged derisive cheering. ^ "Finch (or Finch-Hatton), George William (FNC808GW)". A Cambridge Alumni Database. University of Cambridge. ^ Annual Register. London. 1829. pp. 58–63. ^ Stocqueler, Joachim Hayward (1853). The Life of Field Marshal the Duke of Wellington. London: Ingram, Cooke & Co. pp. 147–148. ^ "The Duel". The Duke of Wellington. Kings College London Archive Exhibitions. ^ "George William Finch-Hatton, 10th Earl of Winchilsea". The Peerage. Retrieved 17 February 2018. This article incorporates text from a publication now in the public domain: "Finch-Hatton, George William". Dictionary of National Biography. London: Smith, Elder & Co. 1885–1900. This page was last edited on 16 October 2018, at 02:56 (UTC).